Vous souhaitez poser une question à l'établissement Le Méridien Suvarnabhumi, Bangkok Golf Resort & Spa ? Niché en plein Aéroport de Suvarnabhumi, le Le Meridien Suvarnabhumi Bangkok Golf Resort and S est idéal pour partir à la découverte de Bangkok. Grâce à son emplacement à 62.9 km du centre-ville et 18 km de l'aéroport, cet hôtel 5 étoiles attire chaque année de nombreux voyageurs. Grâce à son excellente situation, l'hôtel permet de se rendre facilement sur les sites incontournables de la ville. Profitez d'une multiplicité de services et d'équipements incomparables dans cet établissement de Bangkok. Un éventail d'équipements supérieurs tels que service en chambre 24h/24, sécurité 24h/24, ménage quotidien, service postal, service de taxi sont disponibles dans cet établissement. Les 223 chambres de l'établissement, réparties sur 9 étages, sont chaleureuses, accueillantes et dotées pour certaines d'équipements modernes tels que télévision écran plat, balance, salon séparé, internet sans fil (gratuit), chambres non-fumeurs, pour n'en citer que quelques-uns. L'hôtel propose diverses excellentes installations de loisirs, parmi lesquelles vous trouverez centre de fitness, terrain de golf (sur site), terrain de golf (rayon de 3 km), piscine extérieure, spa. 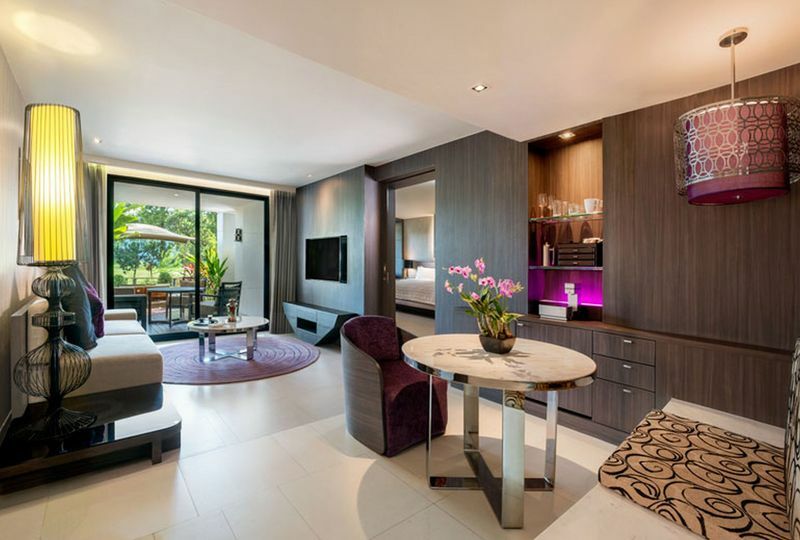 À tous ceux qui cherchent confort et commodité à Bangkok, posez vos bagages au Le Meridien Suvarnabhumi Bangkok Golf Resort and S.
L'établissement propose un service de navette vers Udomsuk BTS Station et Mega Bangna. Veuillez contacter l'établissement pour plus d'informations. Golf, piscine, amabilité du personnel. Un 5 étoile qui n'est même pas doté du Wi-Fi gratuit ! De la grosse industrie hôtelière loin de tout sauf d'un superbe golf et d'une belle piscine. Qualité médiocre de la Salle de bains ... Rapport Qualite/prix extrêmement décevant. Je devais y séjourner une seconde fois à l'issue de mon séjour mais j'ai préféré annuler et réserver un autre hôtel. Hôtel de très bon standing, placé sur un golf et à 20 mn maximum de l'aéroport. 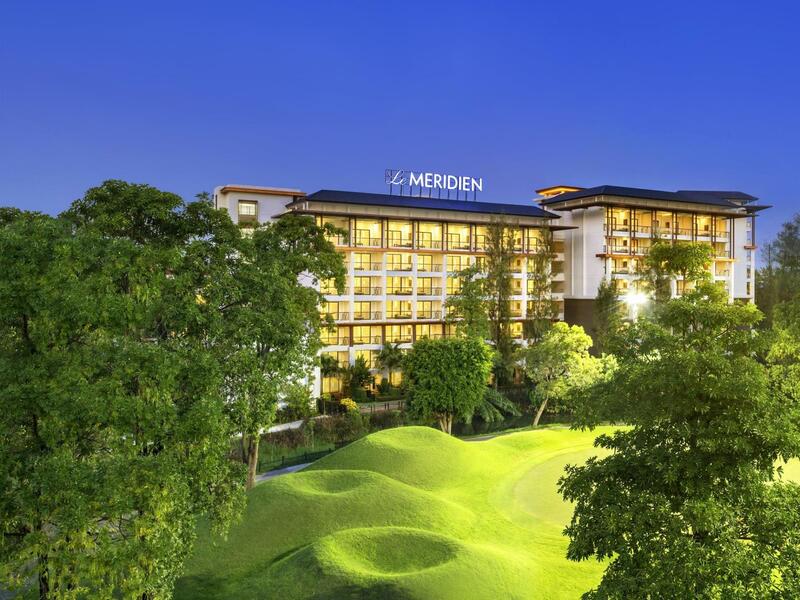 Le Meridien is a top class hotel golf resort that we spent the New Year’s Eve into New Year’s Day. The stay was made special by all the staff we were so brilliant towards us. The room was nice and so extremely clean and relaxing. I would have doubt in saying saying this place is for sure 5 star and the way we were treated was as we were VIP. 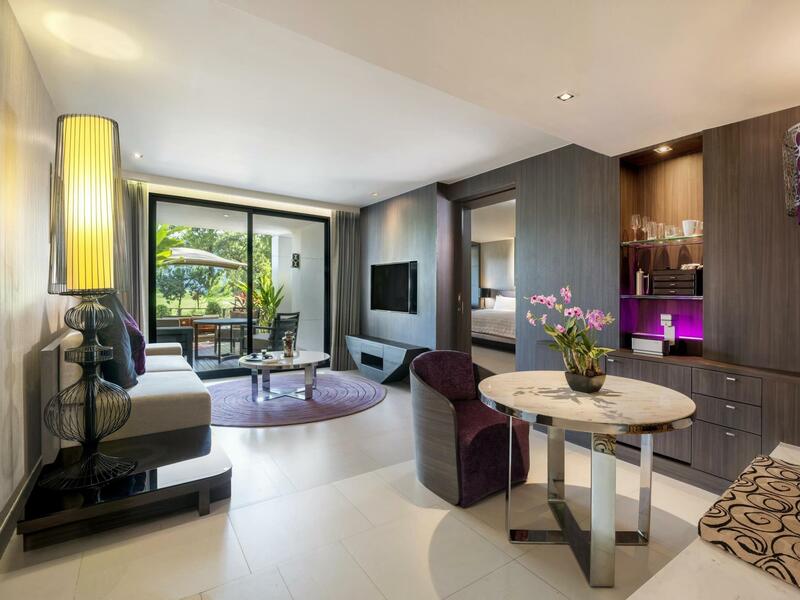 We would really honestly go back to Le Meridien hotel as we need to us a hotel again near to Bangkok Airport. Highly recommended 5 star hotel. 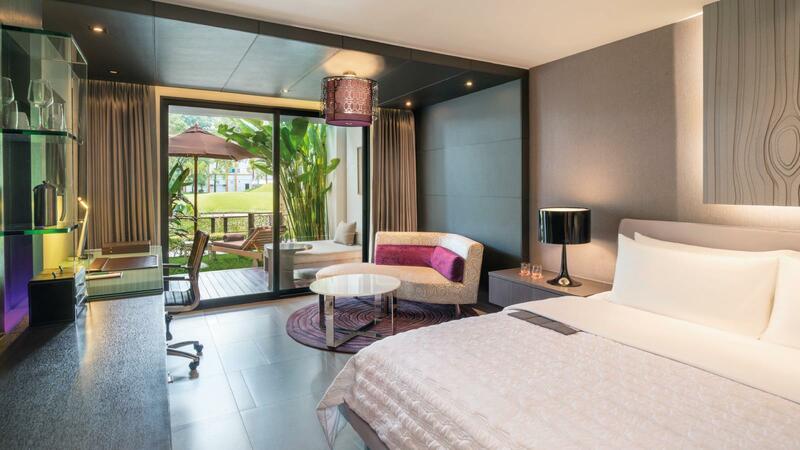 Secluded within one of Bangkok suburbs (Bangna) this hotel is a great getaway option to spend with kids around a quiet and green surrounding with great facilities (pool & kids play room). We chose a club room with access to club perks (drinks, nibbles) which was very satisfactory. I chose to stay here for an overnight stopover between UK and Australia. It was convenient to transfer to and from hotel in the shuttle. The room was large, spacious and comfortable. Being in a quiet location it was ideal to catch up on some sleep. Food at the Italian restaurant was excellent and the breakfast spread was ample - catering to all tastes. We traveled to this hotel as a couple with an overnight in BKK. The airport transportation options were quick, although the hotel is a good 20 minutes away from the airport without traffic. The room was nice and new, albeit the standard Le Meridien vibe (wood paneling, minimalist furniture, white marble, etc.). The public spaces were gorgeous and very well-done. The staff also made us feel welcome with an anniversary gift quickly whisked up to our room upon arrival. The breakfast was delicious and what one would expect at a 5* hotel. Overall, a very pleasant stay at a new hotel, and a good value. We had a lovely stay at this hotel. The front desk staff are all polite and helpful, the restaurant staff is attentive, the maintenance staff around the hotel greet you when you pass by. Our room overlooked a portion of the golf course, which was quite nice at night once the lights went on over the golf course. 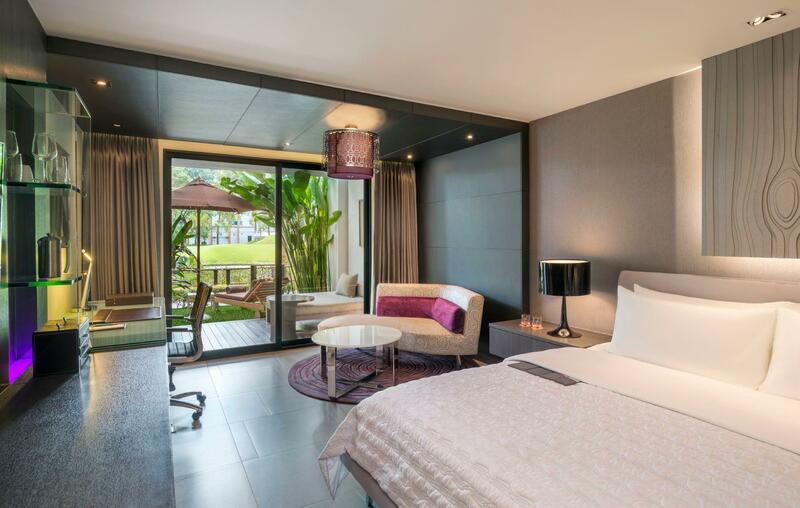 The room is very spacious and has everything you need for a romantic stay. Breakfast was definitely a highlight. The food was varied and delicious, with nice coffee. The pool is nice for lounging and taking a dip. I only have 2 suggestions for improvement. 1 is the lunch. I ordered a burger that was not very tasty and though I ordered a medium cooked burger, they said they would prepare it as well done for my own safety. I'm not a child. 2 is the wifi in the rooms, it's not free. You would think that in 2015 all hotels would be providing complimentary wifi in the rooms. Overall, a great stay though. We would come back. Stay was great. 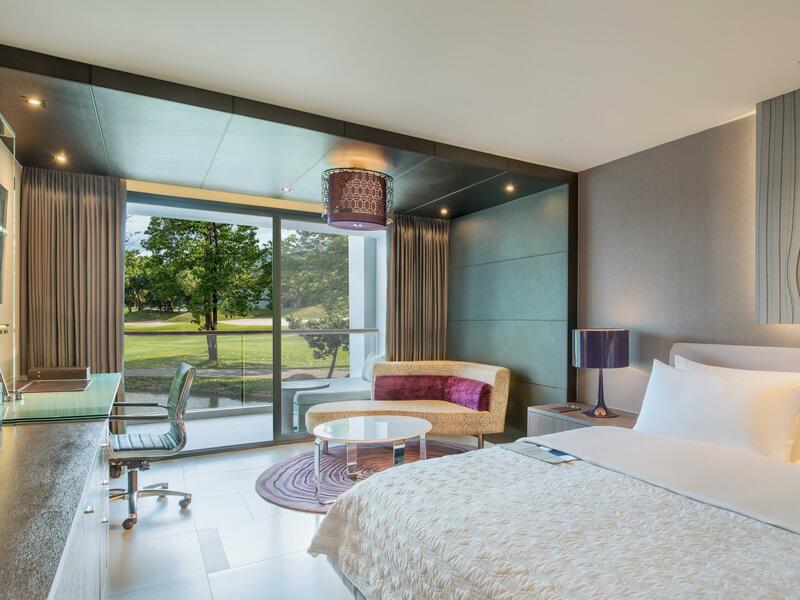 Room spacious with a nice terrace overlooking the golf course. Night lights were switched off on Monday. The food at restaurant was real tasty and the breakfast sumptuous too. Being so close to the airport a super alternative to other airport hotels. We stayed here for one night before we fly back home from BKK airport. The hotel is just 15 min away from the airport but is in the middle of a golf course. We stayed in a room with private garden including outdoor day bed. The room is spacious and comfortable. There were wide variety of breakfast choices which was all very delicious. Stay for one night as I was on transit. Hotel was located in secluded location, looks kind of eerie. Was travelling with another female friend and we were so scared that we could be driven to the wrong hotel. Upon arrival, the entrance of the hotel looks grand and elegant but I can’t say much about the room For the amenities, we had to make 3 seperate calls to the hotel staff:. 1) no slippers ! 2) no combs 3) bedroom not carpeted 4) bed room lights near the balcony couldn’t be switched off !! We had to sleep with the lights switched on !! 5) marketing collaterals were scribbled by previous guests, obviously housekeeping didn’t check ! Though the employees were pleasant and helpful, I won’t come back again. Close to the airport and very nice resort. Big room and very clean. However, there's a lot of mosquitoes near the swimming pool during the night. We booked trough Agoda, and despite informing that we were two adults and two adolescents, including the ages, the hotel provided accommodations for three. Very chill hotel with good view to the golf course. 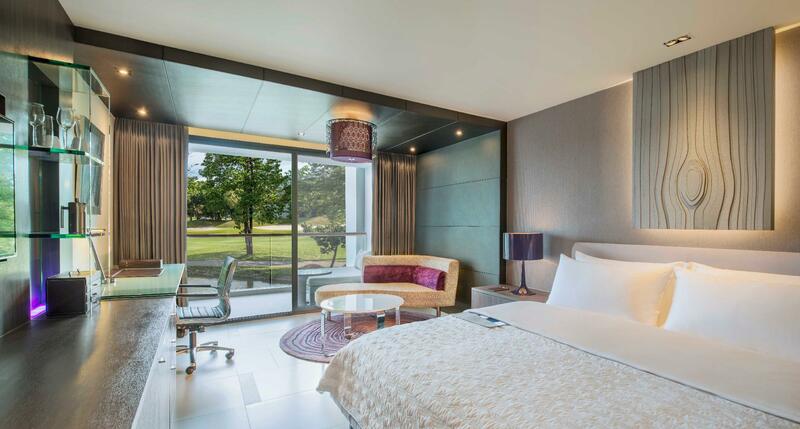 Consider this hotel if you are looking for a hotel near Suvarnabhumi airport. great service. clean. kids club was good too. I have been visiting the property since they openned. Every year the check in, Spice restaurant and concierge team gets worse in English and is unable to understand and as a result the brand experience detoriates. The service is extremely slow and unbearable at the Spice are restaurant. The menu is exactly the same since they opened. The balcony cushion is filthy. The water pressure in the sgower is like 3rd world. The air con and phone did not work this time. It is just poor. I loved it here. It was perfect. The hotel is set in extensive ground and we didn't leave the grounds the whole time we stayed there. The all you can eat buffet is fantastic. I would highly recommend this place. We booked a one bedroom appartment, it is specious. But my daughter walked without shoes and 5 mins later her feet are very dirty. Very nice swimming pool, one for children as well. Nice play room for kids. Nice view with golf. The food was ok, not extraordinary. We had a plane at 9 next morning, good location for airport. But shuttle charged.